Discount Magic - Ultimate Egg Bag. This is the classic egg bag and comes with wooden eggs. 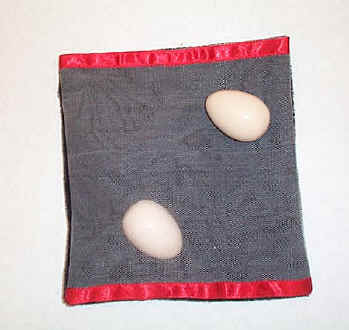 A see through net bag is shown with a egg in it. The egg is visible dropped into the hands and free shown. The egg is then put away and it magically appears back into the bag. Use this Egg bag to vanish and produce as many eggs as you want. We supply one wooden egg with this set. This trick is basically the same as a normal egg bag to make ..